Charles Dickens’ A Christmas Carol has become a beloved part of the literary canon–and for many an indispensable part of the holiday season. The story embodies the goodwill associated with the Christmas season–and it has the Victorians’ favorite elements of a good Christmas story: ghosts. Dickens wrote other Christmas tales that also incorporated phantoms and ghosts, as did his Victorian cohorts. But why this obsession with ghosts at Christmastime? By Dickens’ time, Christmas was not much of a holiday. In fact, for most people it was still a work day. The Industrial Revolution meant fewer days off for everyone, and Christmas was considered so unimportant that no one complained. This was thanks to none other than Oliver Cromwell, the Lord and Protector of England in mid seventeenth-century England. Cromwell had toiled to eradicate Christmas altogether because the holiday had no scriptural basis; the Bible mentions no “holy day” other than the Sabbath and certainly doesn’t exhort Christians to celebrate Jesus’ birth on December 25. 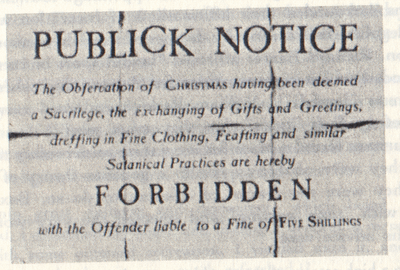 Furthermore, Cromwell knew that the date of December 25 was shrewdly chosen by early Christian officials who wanted to replace pagan rituals with Christian ones. The day was selected because of its association with two pagan holidays, Yule and Sol Invictus (the birthday of the Unconquered Sun). Both were celebrated in conjunction with the winter solstice, the longest night of the year. On this night, the boundaries between the physical and spiritual worlds were considered particularly permeable. It was believed that spirits would return to Earth to finish unsettled business–exactly what Jacob Marley does in A Christmas Carol. While there’s scant proof that the Christmas ghost tale existed as a consciously undertaken tradition before the Victorian era, there is etymological evidence that the tradition stretches back at least to Shakespeare’s time. In “A Christmas Tree” (1859), Dickens writes, “There is probably a smell of roasted chestnuts and other good comfortable things over time, for we are telling Winter Stories–Ghost Stories, or more shame for us–round the Christmas fire.” That phrase “winter stories” and its variant “winter’s tale” had mostly fallen into disuse by Dickens’ day, but it refers to a fantastical yarn that one would weave to entertain interlocutors around a wintertime fire. An even more specific connotation for “winter story” or its relative “winter’s tale” notably shows up in Christopher Marlowe’s The Jews of Malta (1589) with a very specific definition: a “winter’s tale” is a ghost story. At a dinner held in his honor, Dickens admitted his devotion to Irving, who was in attendance. The Victorian Age was one in which spiritual beliefs were constantly being upended by scientific discoveries. It’s no wonder that Victorians turned to spiritualism and other superstitions to distract from that state of uncertainty, or that seances, table rapping, and other fads took hold. Another of these was telling ghost stories, and Dickens was far from the only author to participate. Sir Arthur Conan Doyle was noted for his rather eccentric spiritualism. Edith Nesbitt, Elizabeth Gaskell, and Rudyard Kipling all wrote ghost stories that often get overshadowed by their more famous works. And Henry James uses Christmas ghost storytelling as a frame for Turn of the Screw. Most importantly, Washington Irving had actually presaged Dickens’ A Christmas Carol and The Pickwick Papers’ Gabriel Grub character (a character visited by goblins in Mr. Warble’s Christmas tale) with his own depictions of the Christmas holiday, a relationship that we’ll explore in an upcoming post. The tradition of telling ghost stories at Christmas stuck. Slightly later, Eton Provost and author Montague Rhodes James would entertain his students with ghostly tales around the Christmas fire. HP Lovecraft’s “The Festival” was written for Christmas. And twentieth-century Canadian author Robertson Davies would spin ghost tales for Massey College students every Christmas season. Though not widely practiced, the winter’s tale lives on as a Christmas tradition. This month, in anticipation of the Christmas season, we offer select acquisitions of Dickensian Christmas literature. We invite you to peruse the list, which includes 60 items. Should you have a question about any item, please don’t hesitate to contact us! This entry was posted in 19th-Century Literature, Charles Dickens and tagged Charles Dickens, Christmas, ghost stories, Oliver Cromwell on November 26, 2013 by tavistock_books.